I have a serious sweet tooth. Give me red velvet cupcakes with clouds of cream cheese frosting, a slice of lemon meringue pie, or warm chocolate chip cookies out of the oven and I'm an extremely happy camper. But actually, it's hard to find a lot of perfect desserts here in Taipei unless it's a bowl of shaved ice. But if you're a fan of cream puffs, you're in luck. 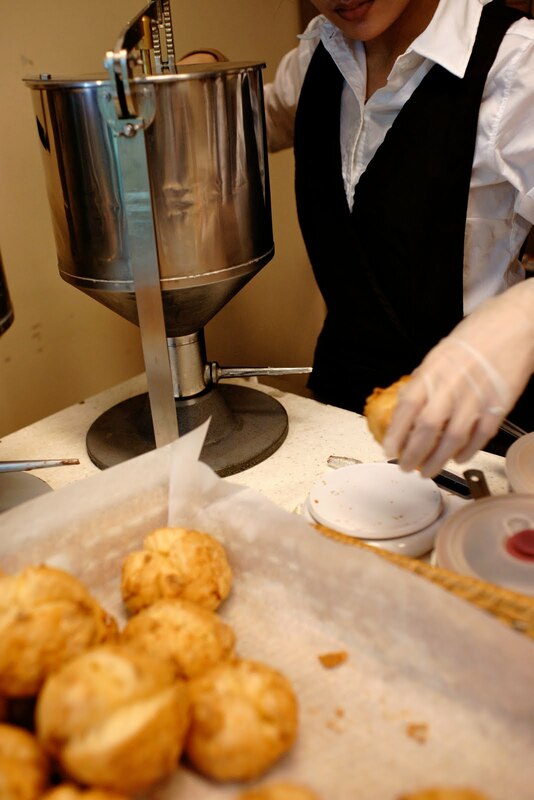 You might have heard of Beard Papa which makes a cream puff so popular it's found its way to the US and of course has shops all across Taipei. At the counter, you can see their menu- besides cream puffs, they also sell (tiny) fruit tarts and pudding. The cream puffs come with custard cream (NT$45), bitter chocolate cream (made with Valrhona chocolate NT$50) or the changing flavor of the month, banana mango cream (NT$55). Once you figure out how many cream puffs you have to bring back and share with everyone, they'll take the puff, pump in the cream and dust it with the right flavor so you can tell which is which. On my second visit, I can't even wait to get home to eat my cream puff. The puff itself is light and crispy on the outside without being too dry and moistened with the cream on the inside, which my friend likened to tapioca pudding. If you're looking for vanilla flavor, then Beard Papa's has a stronger vanilla bean flavor. This one tastes like custard that oozes out of an eclair. Every bite I took, I asked, how do they make it so freaking good?! The chocolate is worth trying too- it's not totally bitter like the name, but it's got a deeper dark chocolate flavor than you'd expect, courtesy of the Valrhona. I thought it would be a grown up's cream puff flavor, but my friend's kid devoured his faster than we ate ours. If you purchase some to take home, definitely try to eat them the same day, as they soften and are definitely not the same experience the next day. That is, if you don't eat them all before you get home. There's a Beard Papa in Melbourne, Australia, too. Awesome puffs! Not to detract from Laetitia's cream puffs, but what happened to the mango cream ones that Beard Papas used to offer?! **drools** reading ur blog is dangerous, it's so yumm-ilicious! These look yummy. The set up and the puffs looks a lot like Beard Papa's. Love the custard that comes out of eclairs.. I tried their cream puff earlier this week too! whats the temperature of the cream inside? is it room temp like chouxcream or does it taste best cool like custard? Just reading about cream puffs makes me hungry. I'm drooling all over my keyboard! Aside from tiramisu, cream puffs are my favorite desserts. I'm just happy there's a Beard Papas in Seattle. jar of buttons: wow, beard papa everywhere! nicholas: haha, it's probably seasonal and only in the summer? jeff huang: haha, there's your answer nicholas! kirbie: yes, definitely similar. i think they are both japanese/french. kathy: did you like it? thanks for commenting! kathy: haha. thanks for reading from seattle!